Goals, like any tool, can be used to bludgeon ourselves over the head with shame and guilt, or can be used with intention, as a way to consciously deep our practice in life. I’ve been known to rail against having goals from time to time, to espouse goal-less living … but the truth is, goals can be used to guide us if they’re used intentionally. Goals are not the answer to everything, but neither are they evil. They’re simply tools. Imagine that you wanted to sail to a certain port (your career goal) … there are two ways that could go, depending on how you work with that goal. You fix your sights on that port (the goal) and map a route to get there. But things don’t go as planned (maybe you didn’t work hard enough, got distracted, or other things came up) and now you feel discouraged. You can either give it up entirely, because the goal is making you feel pretty bad about yourself … or you can hold firm to the goal and resolve to do better. A storm hits you, then your boat starts falling apart, and you get sick during the journey. You start using your lack of progress towards you goal to beat yourself up more, feel shame, think of yourself as a failure, get frustrated with the world. Maybe you give up, or maybe you firmly stick with the destination and get some new resolve. But maybe you learn more about this destination as you travel toward it, and learn that it’s not really what you want. Maybe you find other ports that would actually be better to sail toward, that you didn’t know about before. Nope! You have to stick to the port you originally chose! No flexibility, the goal is the most important thing. Maybe (if you’re tenacious and also lucky) you get to your port. You feel a momentary happiness at your accomplishment, but this destination isn’t what you envisioned it to be. It’s not the solution to all your problems, not the joy you hoped it would be, and you feel let down. You immediately start thinking about your next destination, and barely notice the one you made it to. Using the goal to beat yourself up and create shame, guilt, disappointment. Sticking firmly to the goal even when you learn about better opportunities along the way, with no flexibility. Thinking that there’s something magical about reaching the goal that will change your life in some way (rarely true). The forward looking mindset (instead of looking at the present) will not end when you reach the goal, but will cause you to look toward the next goal immediately (maybe even while you’re heading toward the first goal). So what’s a more helpful way? 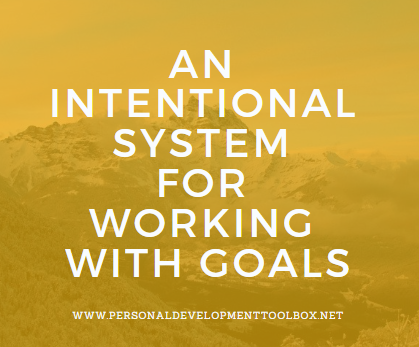 An intentional, conscious way of working with goals. You think of this goal as an intention that you’re setting as you start out, a way to guide your direction in the current moment, not a fixed path. You don’t think of the port (the goal) as a fixed outcome that you need to hold onto tightly, but rather just a way to guide yourself right now. When you do notice yourself attached to the fantasy of your goal, you practice loosening your grip on it, and focus instead on the present moment. What action can you take right now that’s aligned with your intention? Allow yourself to be flexible — if you’re not tightly attached to the goal, you can shift as you learn more, as you sail on your journey and understand the journey more, as you find new opportunities that might be more aligned with your deeper purpose. If/when you do arrive at your destination, stop and be present with it, appreciating your journey, appreciating where you are, without immediately turning to the next thing. This is a more flexible way of working with goals, and a more present-focused way of working, more intentional. The goal doesn’t become the most important thing — though it is helpful — the present moment and your actions and appreciation in the moment become the most important things. I encourage you to try this flexible, intentional method out as you think about what your goals might be for the next month, for next year, for your career and future. How do you translate that intention into right now?